Macedonia, a landlocked country located in the Balkan Peninsula in Southeastern Europe bordered by Kosovo, Serbia, Bulgaria, Greece, and Albania has a total land area of 9,779 square miles and a population of over 2.1 Million. Macedonia framed by mountain ranges is mostly rugged. It ranks very low among the per capita GDP for Europe and recently a flat tax system has been introduced to make the county attractive to foreign investment. Textile, leather, and tourism are the major sectors of its economy and plans are in place to bring technology, energy and mining and consumer sectors up to speed. Macedonian opium juice extracted from its poppy is one of the best quality opium in the world. June through August are considered the best time to visit the country. With its scenic mountains, rivers, lakes, sites of historical importance, and flair for architecture, music and poetry it is no wonder Macedonia is a popular tourist destination. The major attractions are Skopje, Ohrid, Bitola, and its various national parks and reserves. Its cuisine is a an eclectic blend of cuisines from its neighboring countries, Italian, German and East Euopean countries. Tavce Gravce is its national dish and almost all dishes are accompanied by the famous Shopska salad. Macedonia Bradt Travel Guide 978-1841622972 $20 Good maps and an excellent 70-page traveler’s introduction. Part II covers Skopje, Outside Skopje, Lake Ohrid and Galicica National Park, Pelagonia, Prespa and Pelister, Northwest and the Mavrovo National Park, Northeast and the Middle Vardar, and Southern Wine Region. There is also a section on hikes. Republic of Macedonia Map 978-9630296670 $13 1:250,000 scale. The first stamps of Macedonia were a set of two stamps released between 1992 and 1993 showing bas-reliefs. The set (Scott #1 to #2) is inexpensive and catalogs of around 60c MNH or used. Another set (Scott #21 to #23) of three stamps released in 1994 that were surcharge overprints on some of the first issues fetch slightly more and catalogs for around $3. The country was part of Yugoslavia before it declared independence on September 8, 1991. The first issue was followed by a set of two stamps (Scott #3 to #4) in the Christmas theme in 1992 and another set (Scott #5 to #7) of three stamps showing the National Flag in different denominations in 1993. The sets catalog for around $3 MNH or used. A set of four stamps in the Fish theme released on March 15, 1993. The set (Scott #8 to #11) catalogs for around $6 MNH and around $4 used. The designs show rutilus macedonicus and salmothymus achridanus. The country has over 50 lakes, three of which are large. Lake Ohrid in the South is considered one of the oldest lakes in the world and supports over 200 endemic species. It is UNESCO World Heritage Site. The lake covers a surface area of 138 square miles and the average depth is over 500 feet. A set of two stamps released on December 19, 1995 in the Church theme. The set (Scott #62 and #62A) catalogs for around $45 MNH or used. 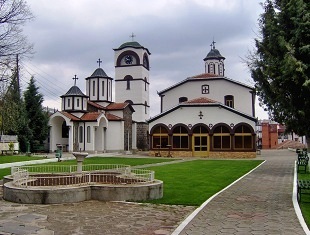 The designs show the Saint Bogorodica Church of Ohrid. The set was released to mark the 700th anniversary. Ohrid is a naturally beautiful large town with rich history making it a UNESCO heritage site. The town has many historically significant churches. The Saint Bogorodica Perivlepta Church built and painted in 1295 featured in this set show couple of important frescoes. A set of four stamps and a souvenir sheet released on September 25, 2004 showing Birds. The set (Scott #312 to #315 and #316) catalogs for around $10 MNH or Used. The designs show waxwing, woodchat shrike, Rufous-tailed rock thrush, Eurasian bullfinch, and wallkeeper. A block of four stamps and a souvenir sheet of four stamps in the Europa theme released on November 14, 2005. The set (Scott #352 and #353) catalogs for around $65 MNH or used. The set was released to mark the 50th anniversary of Europa stamps and feature other stamps. The first coins of Macedonia were Republic Standard Coinage Brass Denis issued in 1993. The issues have very high mintage well into the 10s of millions and catalog for a few dollars in UNC. Macedonia started issuing low mintage commemorative gold proofs in 1996 with the issue to commemorate the 5th anniversary of UN membership. The design shows National emblem within circle in Obverse and Storks within circle in Reverse. The commemorative gold proofs catalog for a slight premium over bullion value. Ancient Coins $10 and up Coins from as far back as around 500BC are in the market. Prices start around $10 and go well into the 1000s for rare issues. Other Coins $2 and up Common UNCs from the 1990s onward starts around $2. First set from 1993 in UNC starts around $10. 100-piece UNC sets start around $30 and can go well into the 100s for the first issue sets. Paper Money $2 and up Recent UNCs starts around $2. High Value UNCs, Consecutive Serial Number Sets of 5-pieces or more, etc start around $10. Rare Specimens, Year Sets, etc start around $40. Bundles, Rare Notes, and High Value Specimens go well into the 100s. Replicas from Macedonian ancient artifacts, art and wine are typical souvenirs. Antiques $10 and up 19th century maps start around $5. 19th century handcrafted wood boxes start around $50. Vintage ethnic blouses, Semi-precious rings, and older maps start around $100. Art $10 and up Folk costume and certain architecture fragments vintage art prints start around $10. Coat of Arms sculptures and plaques start around $60. 18th century gold-silver rings, original paintings etc start around $100. Miscellaneous Collectibles $3 and up Patches, Badges etc start around $3. Military medals, WW photos, Air Force Combat Pilot Wings, etc start around $30. Wound Badge Orders, Cavalry Cross Civil Merit Orders etc start around $100 and go well into the 100s and 1000s.